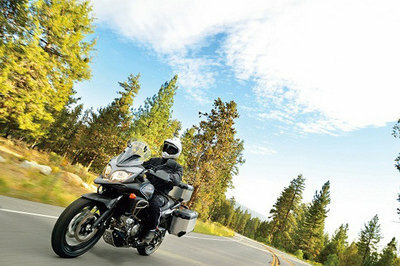 The V-Strom 650X EXP is fully equipped to handle long distance riding on all roads with comfort, control and excitement. 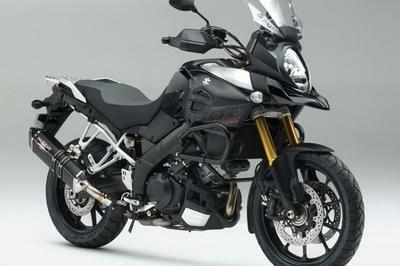 Continue reading for more information on the Suzuki V-Strom 650X ABS EXP. Wire-spoke aluminum-alloy rims absorb shock effectively at low speeds to promote friendly handling characteristics. Aluminum Side Cases & Top Case, Vario Windshield, Engine Guard, Under Cowling, Hand Guard are standard equipment on the V-Strom 650EXP. 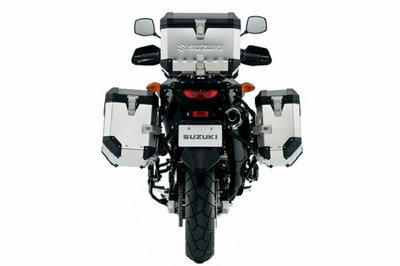 Beak-like front cowl reflects Suzuki’s spirit of adventure by evoking the DR-Z ridden in the 1988 Paris-Dakar rally. 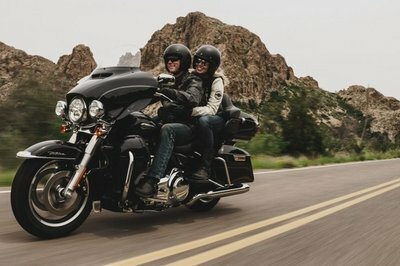 645cm3, V-Twin engine features broad torque delivery, signature V-Twin power pulses and sporty quick-revving high rpm range power surges for a full-range riding enjoyment. 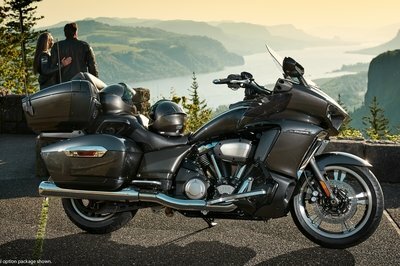 Efficient engine designs deliver high mileage and class-leading riding range. Twin iridium spark plugs for each cylinder heighten the spark strength and combustion efficiency, contributing to increased power, a more linear throttle response, easier engine start-up and a more stable idle. The 6-speed transmission is tailored for active sporty rides with 1st through 5th gear ratios, while keeping highway cruises comfortable with a tall top gear. Spring-preload-adjustable 43mm-stanchion-tube front forks and link-type rear suspension with rebound stepless damping adjuster as well as a spring preload adjuster. Front dual 310mm-disc brakes and rear 260mm-disc brakes deliver smooth, controllable stopping power. 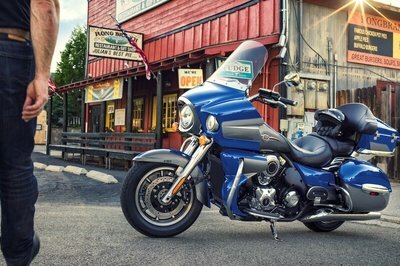 Expansion-resistant high-pressure brake hose enhances the responsive brake feel. The seat height can be factory lowered with Suzuki factory suspension modifications performed by a dealer. 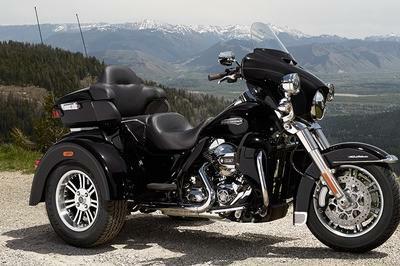 Comfortable riding position composed with a well-shaped seat, slim 20-liter fuel tank and compactly tucked-in frame covers make the rider feel at one with the machine. Lightweight resin luggage carrier comes with a slip-resistant rubber mat and is one piece with well-shaped, easy-to-grasp grab bars. 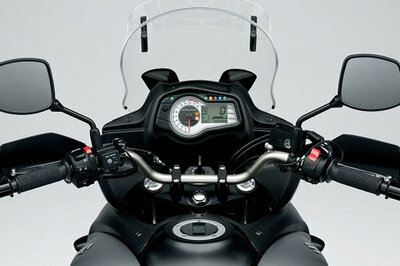 Instruments with an analog tachometer and brightness-adjustable LCD speedometer. LCD readouts include odometer, dual trip meter, gear position, coolant and ambient temperature, average fuel consumption, fuel gauge and clock. LED indicators include a road freeze warning indicator which, together with the ambient temperature display, helps riders’ awareness of road conditions.